Yum yum yummm. 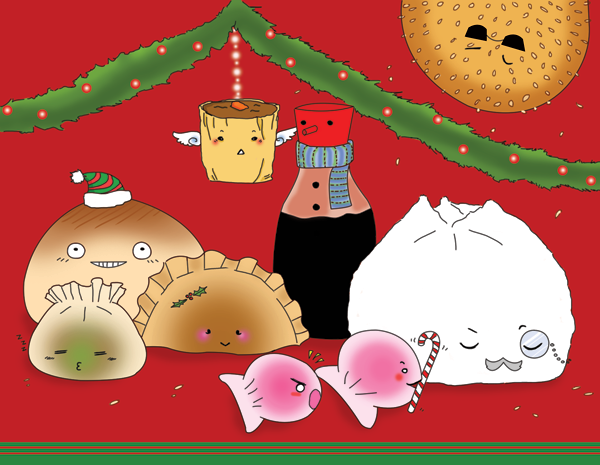 Keeping with the food Christmas post card theme from years past (here and here), I tried my hand at some dim sum squishies this year! Muahaha. Can you tell what types they are? I think people may have trouble with the har gow, as they are maybe too pink. And the potsticker looks more like a calzone than a dumpling. >.>" Sak likes grandpa bao the most, followed by crazy-Totoro-face baked bao. I printed them through vistaprint again, and am super pumped to send them out! It's not even December yet - ahead of the game this year, that's rare! And I get to use the new Aloha shirt postcard stamps, whee! Are you doing holiday cards? i knew exactly what the har gow were! so cute, as always. you have such a great talent. Those dim sums are awesome! :) Am still contemplating sending holiday cards. Cardstore.com has 'em personalized with 75% off so... maybe yes. Though I find that photo cards w/o little people aren't as cute. So I was thinking we should wait until we have cute people to send Christmas cards. These are SO cute!! I, of course, love the Totoro-faced bao! =) You're so freaking creative, I love it. And Alvina, I used to feel that way about Xmas cards (photo cards when it's just a single or couple), but I've seen some really cute and clever (and funny) single/couple cards, too! We will indeed be sending cards out this year, and it's driving me crazy that I don't already have them addressed and stamped! But sending a holiday photo card with an outdated photo of the peanut didn't seem right, so we're waiting on our photographer to send us what he took a couple of weeks ago. The cards are ordered, though, just waiting for a photo to go in it!! These are amazing! You should open an Etsy shop. I would totally order these. Great job!